Professional Graphical User Interface Library: Commercial library providing GUI components and features in Office 2007, Office 2003 and XP/Whidbey styles for the Windows platform. Includes documentation, trial version and examples. ProGUI is an easy-to-use commercial Windows DLL library that enables you to deliver professional quality, user-friendly and beautifully designed interfaces to your end-user/customers. A simple intuitive API comprising of more than 100 well documented commands, transparently takes care of all the complex details. This allows you to quickly incorporate rich, customizable GUI components into your applications, letting you concentrate on the core engine! ProGUI is my no. 1 for PureBasic, it's simply working the way that I want and is really stable! ProGUI can be used with any programming language that supports external DLL calls. Currently PureBasic, AutoIT and BlitzMax are the only languages that are officially supported, however more DLL wrappers (C/C++, ...) will be made available soon! Easy to use and simple API with commands such as "MenuTitleEx(title$)"
Extremely fast rendering with internal caching and intelligent double-buffering. One of the most accurate replicas of Office 2007, Office 2003 and Whidbey styles that exist as well as improvements over Microsoft's engine such as flicker free menu tracking and superior menu scrolling! Native 32 bit and 64 bit versions included! Windows 10, 8, 7, Vista and XP compatible. 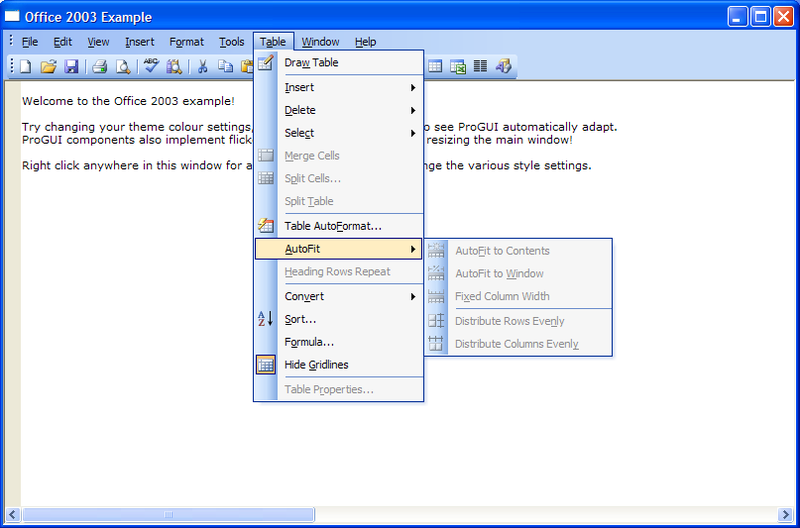 Full Source Code included in ProGUI Gold and Platinum editions. Extended menus! Have cool "floating" menus contained in a rebar/container with ease! Full support for 32bit alpha masked icons/images of any size. Support for different images for normal, hot and disabled states as well as escape-code effect text. Includes extended system menu and popup menu. Different styles of menus available for example: Office 2007 style menus, Office 2003 style menus , Office XP/Whidbey style menus, IE Explorer style, Classic/Mozilla Firefox Style and other styles. Automatic wrapping of menu titles when window resized too small! Automatic detection of system font change and resized accordingly. Full keyboard navigation and hot-key support. When menu goes off screen automatically fits inside screen. Rebars! (IE Explorer style container control), multiple rebars on multiple windows! Extended rebar functionality including new Office 2007 and Office 2003 styles, auto vertical resizing and user vertical resizing. Extended toolbars, full 32bit alpha masked icon/image support of any size for toolbar buttons with separate images for normal, hot and disabled states. Button label text can also contain escape-code effect text. Other controls can also be placed in a toolbar. As many toolbars as you want on multiple windows! New Office 2007/Office 2003 Toolstrip style toolbars! 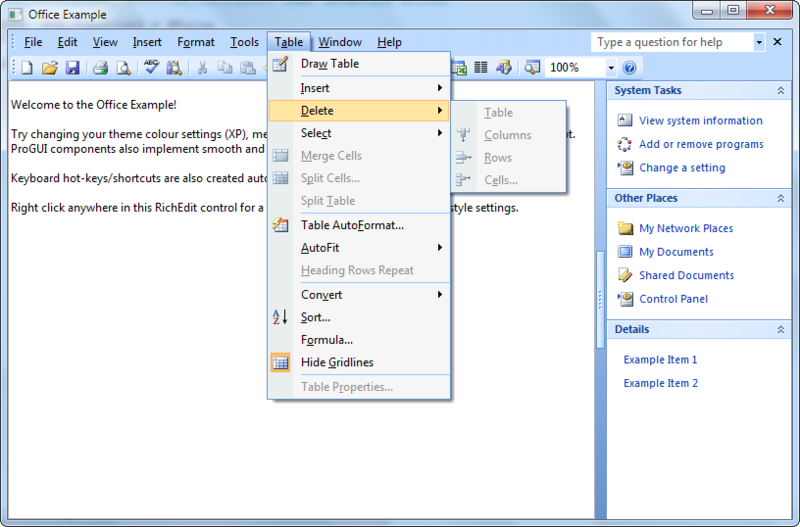 Office 2007/Office 2003 styled ComboBoxes when placed in a toolbar or rebar. 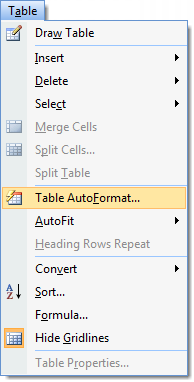 Support for drop down buttons in toolbars, just pass a popup menu or extended popup menu to the command! Theme adaptive custom user defined colours for User Interface styles.